New Frontiers Health Force is a faith-based non-profit 501(c)3 organization. We have spent the past twenty years doing global medical missions work which has included health care, disaster relief, education, and promoting hope with our volunteer teams in 35 countries. Over the past ten years, we have been based in Ngoswani, Kenya where we operate a fulltime health center and primary school. We are committed to excellent health care and quality education. The founder and president of the organization is Dr. Tonya Hawthorne, DO. 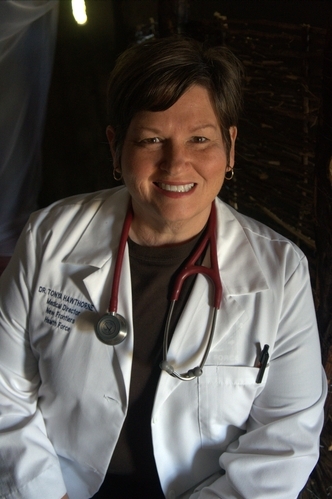 She is a board-certified Osteopathic Family Physician and has dedicated her life and career to global health care. In 2002, Dr. Hawthorne was awarded The President’s Call to Service Award from President George W. Bush. This award was created to recognize men and women who have dedicated their lives to helping others. The Ngoswani Community Health Center serves the needs of the Masai community with comprehensive medical services ….. The Linda’s Kids Academy is a primary school with 46 village children in attendance….